1 tray of Flare Short Red Cherry Individual Lashes. 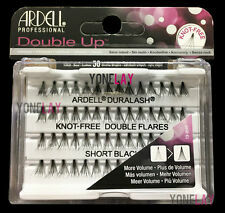 Ardell Duralash Soft Touch Knotted Flare Trios Individual lashes in Short length. 1 tray of Authentic Red Cherry Flare Long Individual Lashes. You will receive 1 tray of Single Short authentic Red Cherry Individual Lashes. 1 tray of Flare Short Red Cherry Individual Lashes. Type Individual/Cluster Eyelashes. Country/Region of Manufacture Indonesia. Length Short. 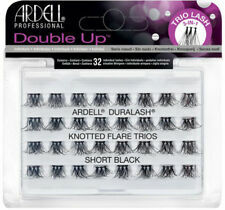 Ardell Duralash Soft Touch Knotted Flare Trios Individual lashes in Short length. Type Individual/Cluster Eyelashes. Country/Region of Manufacture Indonesia. Length Short. Modified Item No. Features Reusable. Get the closet thing known to natural lashes. These exclusive individual lash clusters are permanently curled, waterproof, weightless and easy-to-apply. Custom Bundle Yes. Country/Region of Manufacture Indonesia. Length Short. DuraLash Individuals Lashes Set - Short Black. These lashes are the fastest way to have long, luscious eyelashes. Easy to apply and last for weeks.". Bath & Body. Very Easy. This INCLUDES if the plastic wrap or seal is broken on the item. Up for sale is a new Ardell individuals Duralash knot-free Naturals. Ardell Mini Black (Lower Lash) 65094. Eylure Pro-Lash Individual Lashes are perfect for false lash fanatics! High quality individual flare lashes. Lash adhesive and remover is included. Length Individual flare lashes. Features Long Lasting.